U.S. Geological Survey (USGS) scientist Frank Chapelle and his colleagues from the USGS and the University of Massachusetts have discovered a potential analog for life on other planets. The scientists discovered a unique community of microscopic organisms known as Archaea thriving deep in the subsurface source of a hot spring in Idaho. Archaea, a class of microscopic organisms that were once thought to be bacteria, are unique because unlike most life on Earth that relies on oxygen to breathe and organic carbon as a food source (such as decaying plants), Archaea live on a diet of hydrogen and carbon dioxide. Therefore, scientists think Archaea-type microorganisms could exist in worlds without organic carbon, such as Mars or Europa. Archaea are prevalent in Earth's subsurface where oxygen does not exist but are usually found in small numbers compared to more competitive bacteria. For example, the microorganisms (methanogens) that degrade contaminants at chemical and oil spills and produce methane are Archaea. This is the first documented case of a microbial community completely dominated by Archaea -- no other known life form could exist under such harsh conditions. The methods that were developed to study the fluids and microorganisms, including Archaea, in the hot spring area are presently being used by the USGS Toxic Substances Hydrology Program to study the biodegradation of a chlorinated solvent spill in fractured rock at the Naval Air Warfare Center (NAWC) Research Site, West Trenton, NJ. These methods will enable site managers to understand how microbial populations adapt to chemical stresses, and thus how these microbes contribute to the detoxification of pollutants. The results of this investigation of the microorganisms (Archaea and bacteria) at the NAWC Site will one day lead to the development of subsurface contaminant cleanup technology that exploits the power of these unique microorganisms. 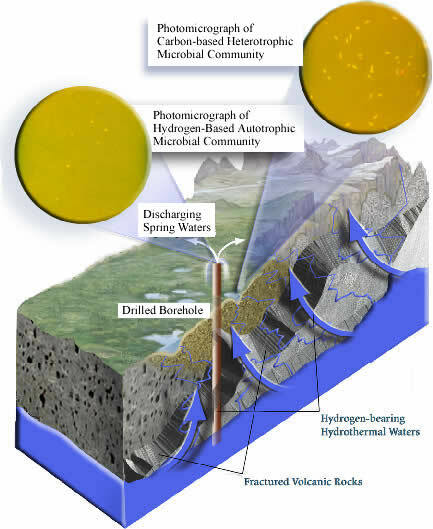 Chapelle, F.H., O'Neill, K., Bradley, P.M., Methe, B.A., Ciufo, S.A., Knobel, L.L., and Lovley, D.R., 2002, A hydrogen-based subsurface microbial community dominated by methanogens: Nature, v. 415, no. 6869, p. 312-315, doi:10.1038/415312a.